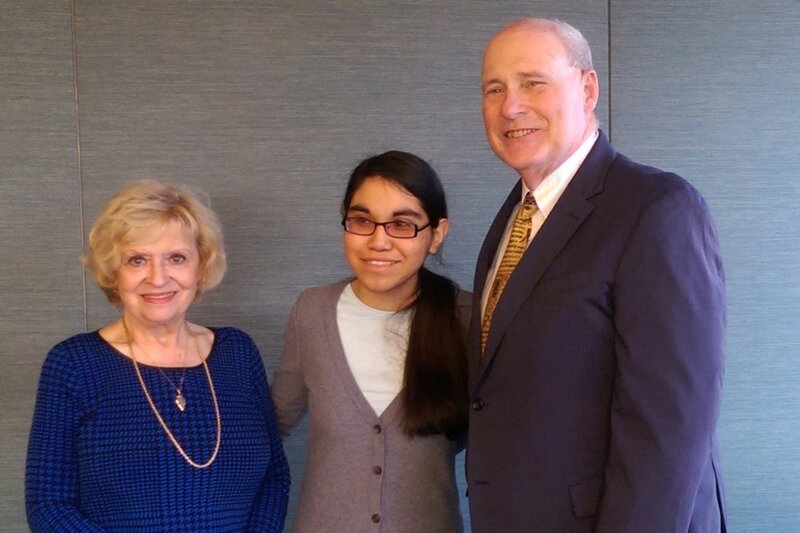 It is our pleasure to introduce Paulina Ochoa-Figueroa as the premier recipient of the Major John H. Mark, Jr. Manhattan College Study Abroad Scholarship. Paulina has been selected to receive this prestigious scholarship during her Spring 2016 semester in Madrid, Spain. Continuing Major John Mark’s focus on Service with Adventure, Paulina is making arrangements to work as a volunteer with Caritas Madrid, a Catholic organization which is dedicated to assisting the Madrid community by coordinating charitable and social action in Madrid. Paulina has chosen to commit a substantial portion of her time, talent and energy to working with children in after school programs which Caritas Madrid provides for low income families. Her duties will be to assist with homework assignments working as a bi-lingual volunteer, providing English language instruction to the children of Madrid. Paulina’s Manhattan College course work in Psychology and Modern Languages will be enhanced by this real world interaction with the children and parents of Madrid. We congratulate Paulina for her sense of adventure by jumping into another new culture with the intention of providing needed and valuable service to the community. This exemplifies Major John Mark’s philosophy of life; Adventure with Service. Paulina Ochoa-Figueroa, a Manhattan College Junior and the first recipient (Spring 2016) of the Major John H. Mark, Jr. Manhattan College Scholarship is a native of Jiquilpan, Mexico, who came to the United States during 2011 to attend New Rochelle High School. Her time in NY has been a whirlwind of activity. Paulina’s passion for reading anything she can get her hands on; her love of Spanish Literature and Culture; her interest in Peace Studies courses; and her immersion in language and culture courses to prepare for her Spring 2016 Study Abroad experience, combined with her goal to become a writer, have kept Paulina quite busy during her College days. While attending Manhattan College, Paulina has consistently maintained an excellent academic record, having been on the Manhattan College Dean’s List each semester; winning the Modern Foreign Language Scholarship award in 2013; and being inducted into the National Hispanic Honors Society (Sigma Delta Pi) which honors outstanding students of Hispanic Literature and Culture. Not being content with her Manhattan College academic honors, Paulina may be found exploring NYC museums or attending concerts in The City; that is, when she is not volunteering her time with local organizations. Paulina Ochoa-Figueroa’s study abroad semester will not be radically different from, but a complement to, her current college experience. She promises that her blog readers will be kept up to date on the various adventures with service opportunities to which she is contributing her time and energy, while truly immersing herself in the Spanish culture of Madrid. Paulina notes, on a personal basis, that she is fulfilling a promise to her late grandmother to research her Spanish family heritage.